Karthika Naïr was born in India, lives in Paris, and works as a dance producer and curator. 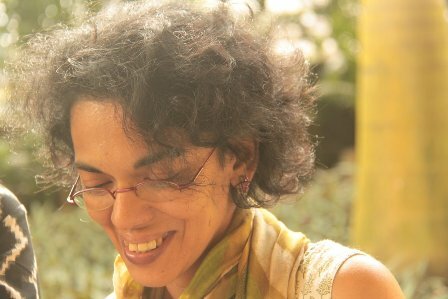 She is the author of Bearings (HarperCollins India, 2009), a poetry collection; DESH: Memories, inherited, borrowed, invented (MC2, Grenoble, 2013), a dance diary; and The Honey Hunter/ Le Tigre de Miel (Young Zubaan, India/Editions Hélium, France, 2013), a children’s book illustrated by Joëlle Jolivet. Nair was the principal story writer and scriptwriter of DESH, choreographer Akram Khan’s multiple-award-winning dance production. She is currently working on her next poetry collection, an account of the Mahabharata war in 18 voices, one of which was recently published as a digital book in the Harper21 series as Satyavati: Fault Lines (HarperCollins India, 2014). In Karthika Naïr’s résumé as a producer, one finds mention of Sidi Larbi Cherkaoui, Damien Jalet, Käfig/Mourad Merzouki, the Louvre, the Shaolin Temple, misadventures with ninja swords and pachyderms, among others, many of which find their way willy-nilly into her poetry (though, hopefully, not into the retelling of the Mahabharata). NAW- Tell us about how you began writing. How long did it take before you had your first book out? Well, I had trained as a journalist initially, and moonlighted as one – with The Indian Express and The Hindu – for a few years before switching to art management. But then I moved to France for higher education (a Masters Pro in art management), got absorbed in the performing art sector here and didn’t write at all for five or six years. I came to poetry quite by accident. You see, I had always been surrounded by, had always swum in, a multilingual environment. But France can be quite monolithic when it comes to language, what one hears almost exclusively in one’s quotidian is French (it is changing a little now, especially in the larger cities but not all that much). I felt starved of languages, of their polyphony, which had always been around me, and of the way they all moved effortlessly in and out of, and around each other. I missed hearing and feeling and wielding these languages. There was a certain linguistic solitude although life was rich and exciting, full of discovery and buttressed by a very strong support system. Poetry, I think, was the only way I could truly talk to myself at that point, the only way I could keep a logbook of sorts. There was definitely – at that juncture – a sense of cartography, both emotional and kinetic. It isn’t coincidental that my first collection was called Bearings, with the ‘e’ an unsteady element. And in that phase of exploration, unveiling and movement, poetry, with its appetite for precision, ellipsis and tangentiality, seemed to be the most honest means of expression in my reach. I was remarkably – perhaps undeservingly – fortunate in the swiftness with which my poetry then travelled from my frog-in-a-well, non-Anglophone, non-literary sphere to a world of poets and writers, agents, editors and publishers. Not much of it was my doing, I owe it to some wonderful souls who read the poems and became active catalysts: Pramod Kumar K.G. (co-founder and first director of the Jaipur Literature Festival), Mita Kapur of Siyahi, Zubaan editor Anita Roy, writers Paul Zachariah, A.J. Thomas and Jeet Thayil, almost all of whom coincidentally (and separately) sent off my initial poems to V.K. Karthika, chief publisher at HarperCollins India. This was in 2007. Karthika was very encouraging, and invited me to submit a book-length manuscript for publication: this became Bearings, which I completed towards the end of 2008 — it was published in June 2009. NAW-Tell us about Desh. What is it about? How did the project materialise? DESH (the title is completely in uppercase, by the way) is a solo dance piece choreographed and directed by British-Bangladeshi artist Akram Khan. It stages Akram’s evolving relationship with his father – through various stages: filial grief, teenage rebellion and incomprehension, the empathy of hindsight – as a mirror of sorts to his equation with his parents’ homeland, Bangladesh. As the piece unfolds, we see how his understanding of the country – viewed initially through distant, second-generation-emigrant eyes – expands and deepens, to encompass more than the images fed through media or external perception. But since the piece is non-linear, it doesn’t transpire like a journey. Or rather, it is a journey through memory, different kinds of memory: the public, collective memory of liberation and tyranny, of activism and resistance to oppression; the borrowed memory of the real, physical meaning of resistance to one person and his family; the inherited memory of language and the lore that comes with it, and the memories invented for a child who grows up very far away from the land. It is a solo – Akram occupies the stage for almost eighty minutes, in nearly one stretch – but seldom is he alone on stage: the voices of other characters people the narrative and his memory: a remembered father, a high-spirited niece, a teenage software trouble-shooter, enemy soldiers, young activists at the Dhaka Blockade of 1987… And it is peopled by the contributions of some phenomenal collaborators: set designer Tim Yip (whom the cinephiles will remember from his Oscar-winning production design on Crouching Tiger, Hidden Dragon), composer Jocelyn Pook, lighting designer Michael Hulls, dramaturge Ruth Little. The piece happened because long ago, at the beginning of his career, Akram’s mother had asked him to make a piece on her country and her people. And he had promised her he would, one day, but then years passed … other projects happened, exciting commissions, company pieces, world tours. In 2010, he felt that the time had come to keep that promise, that whether he was ready or not, it was time to take that particular plunge. Farooq, Akram’s producer and a dear friend, called me in the summer of 2010 and asked me if I would consider scripting the piece. And I accepted, with a sense of grateful inevitability, because Bangladesh has a very important place in my family’s memories too: the 1971 Liberation War was something my parents remembered quite often, so it never seemed like ‘dead history’ to me, as a child. War was declared on the day of my parents’ wedding anniversary, and since my father was in the Indian army, he had to leave for the front the same evening, and my mother – along with other army wives and families – was sent “to the safe zones” immediately, in what sounded like a very cloak-and-dagger evacuation. It was ‘their’ third war, yet it was the one they spoke of the most, the one that had marked them the deepest—perhaps due to the loss of people they knew and liked, perhaps because of the personal association with the date, the dramatic separation. It was also the one that my father evoked to explain to me – when aged nine – why that there is no such thing as an altruistic ally or a noble victor (talking of the Indian involvement in that war). He de-romanticised conflict and war and the myth of heroic leaders quite dispassionately when I was very young—for which I am deeply grateful to him today. NAW- What are you working on currently? A reworking in verse of the Mahabharata titled Until the Lions: the epic – and the eighteen days of war that form its narrative locus, in particular – seen through many sets of eyes (eighteen, if it all goes well). The project began because I read one particular reworking of the Mahabharata (there are so many, ranging from stunning and daunting to migraine-inducing) and it left a strange aftertaste of majoritarian discourse. And I thought, what if the others could tell their stories? The nameless lovers and widows of soldiers, kidnapped princesses whose lives are wrecked by societal codes that are still effective in all too many parts of the world, unwed handmaiden-mothers, animals that were collateral to displays of alpha-male supremacy, outcast warriors…. In surprising and sad ways, many of the social and human equations in the Mahabharata remain tellingly familiar in our lives. NAW- How difficult is it to sell poetry these days when the literary field is dominated by prose? Please tell me you don’t earn your living solely out of poetry. You know, long before I started writing, I read an article in a British daily that stated that in the history of 20th century English literature, the only poet who had been able to earn a living from the sale of her work was Carol Ann Duffy. Nobody else had managed to do so – not T.S. Eliot, not W.H. Auden, not Ted Hughes – and almost all poets had to juggle a day job, or be financially independent. I do not know if those facts are still current (and there are surely other languages/literatures where the readership is more propitious to poetry) but they are revealing. It is a tad more complex that it seems, though. Yes, it’s true poetry collections do not sell by the thousands (though, happily, there are exceptions: Arun Kolatkar’s Sarpa Satra or Jejuri, Vikram Seth’s The Golden Gate, Carol Ann Duffy’s The World’s Wife… to cite just a few) but as poet Adil Jussawala noted recently in an interview many sell steadily across four or five years and exhaust the initial print run. No, poets do not get anything near the lucrative advances one hears bandied about in the field of prose (in fact, most poetry publishers cannot afford to pay an advance on poetry collections) but there are more platforms for readings, for dissemination today, compared to a few decades ago; more possibilities to meet other poets, sustain discussions and initiate collaborative works. There are more residencies to support work and more fellowships … those are real blessings. Yes, it’s still a struggle and most of us who stick to poetry have to be inventive about earning a living through other means. I think we write poetry because we just cannot not write. We write out of conviction but primarily out of necessity, if that makes sense. And I do think humanity needs poetry, it always has. Isn’t it telling that the great founding myths or epics of most civilisations were written in verse? That didn’t make them any less accessible! Maybe our predilection for labels and divisions is more acute now, and we compartmentalize literature too much. Or maybe poetry’s marginalisation is parallel to the decline in oral storytelling. I do wonder about that. And no, I don’t pay my rent with the unfortunately meagre earnings from poetry (I did earn enough to buy a return ticket to India once, though): I have to rely on my day job of a dance producer and curator for that! NAW- Tell us about your other works. Two books were born from the DESH experience. One, a logbook of the making of DESH that was initially a long-form piece commissioned by the Dance Gazette, the journal of the Royal Academy for Dance. The MC2, Grenoble – a state theatre in France, where Akram is associate artist – later published it as Desh: Memories, Inherited, Borrowed, Invented, a bilingual dance diary supplemented with some lovely photographs by Michel Orier, their former director. The Honey Hunter/ Le Tigre de Miel, jointly published by Editions Hélium (France) and Zubaan Books (India) is a children’s book illustrated by Joëlle Jolivet — a wonderful, serendipitous adventure that happened all because Anita Roy, senior commissioning editor of Zubaan, saw the first pages of the children’s story I invented to incorporate into the script of DESH (amidst five or six other narrative threads) and insisted it should become a book. The “world English edition”, as they call it, will be out this fall (with Little Gestalten), and also the German edition. And HarperCollins India just brought out Satyavati: Fault Lines, an excerpt of Until the Lions as part of the Harper21 series, their digital books stable. Until the Lions itself should be out towards summer next year. NAW- Which authors have influenced you? Choreographer Anne Teresa de Keersmaeker, for what dance critic Sanjoy Roy calls her “exacting pursuit of compositional principles.” I am still spellbound by her Fase, all of 32 years now (and made when she was just 22). And her latest work, Vortex Temporum, would have me genuflect for the precision and clarity with which it dissects those compositional principles, the innards we don’t usually see as a spectator. My diptych of poems Ya’aburnee and Quittance reference the structure of Violin Fase, incidentally. Rachid Ouramdane and Gregory Maqoma (choreographers again) are touchstones for their fearlessness, their capacity to make the political intensely personal and therefore vital, our own. Loin (by RO) and Beautiful Me (by GM), in particular, but actually everything they make has that engagement, and a genuine desire to go deep beneath the surface. They are seldom didactic, and seldom do they stage facile binaries: this complexity makes their work even more appealing to me. The late Patrice Chéreau, an icon in French theatre and cinema, for work that is intensely, scathingly, magically close to, yet more than, life; for his pursuit of truth, truth that can be iridescent as poetry, visceral as only bloody entrails can be and overlooked as a scab. I loved his belief in theatre’s need and duty to enchant and I am still in awe of his ability to engulf your existence in little more than an hour. That art could be so much, so very much — yes, I learnt that from Chéreau. He had an astounding talent for highlighting the body – whether the sexual or solitary body (Intimacy), the body as a ‘meditation on mortality’ (His Brother) or as a mirror to the elements (I Am the Wind) – and for making it the locus of his work. That may sound unsurprising in theatre, but actually, it’s a rare and precious gift. I have always wondered if the body could be as vital in writing. I suppose I am trying to find out. Amba: Manual for Revenge and Remembrance (from Until the Lions) definitely draws heavily on Chéreau’s microscopic scrutiny of the body. As for Sidi Larbi Cherkaoui, the dancer-choreographer with whom I’ve worked since 2006, he is not so much an influence as a – beautiful – reaffirmation, one that was my impetus for many years. I know few other artists who so genuinely and keenly disregard distinctions between high art and low art, between modern and traditional, who traverse divides between cultures and languages, drawing from a myriad of artistic and popular practices – from something as abstruse as medieval music or sufi rituals to something as seemingly new and trendy as manga, going far beyond appearances and clichés. He works with older dancers, disabled actors, Shaolin monks, street dancers, internationally renowned visual artists like Antony Gormley, designers like Karl Lagerfeld, ballet stars like Carlos Acosta — and he never hierarchises between their art, a rare trait and one I have immense respect for. And those are only the artists I am constantly aware of, there must be dozens more whose words, whose euphony or stringency or worldview must have rubbed off in different ways. I work as a dance producer and curator — as mentioned earlier, that is what pays the rent, not poetry! It does entail a great deal of travel, very late nights and early mornings – one tends to work across half-a-dozen time zones, even when sedentary; and there’s a fair a lot of crisis management involved (fortunately, not of the natural disaster kind! ): there’re always passports astray or a visa that hasn’t arrived on time, or more resources needed for the sets of a new production or a substitute singer to find at the eleventh hour and so on. Since I am also associate curator of a dance festival, I do watch a lot of shows, other choreographers’ works, as well, and that takes up a lot of evenings. And EB, a congenital disorder I have, swallows up a lot of my time. It is a bit of an untameable beast, and can cause very bad nights and days, and it requires a fair bit of time in hospital. NAW- Name your five favourite authors. This is difficult again, because I tend to cherish books more than authors, if that makes sense. May I pick a few books instead? The Cinnamon Peeler by Michael Ondaatje. Always. Marilyn Hacker’s Names, for the effortless, innovative use of traditional forms and such an eloquent, engaged voice. Saadat Hasan Manto’s Mottled Dawn, for a reminder of the horrors and salvation of humanity, for despair in humour and abandon in love. Orhan Pamuk’s My Name is Red. I don’t know any other book that manages to balance the multiple-narrative structure (with so many narratives!) to such pitch-perfection, or to integrate two opposing philosophies of art into a murder story with brio. Shame by Salman Rushdie, which I consider his most unforgettable work. But my comfort reading for all seasons is Haroun and the Sea of Stories, pure alchemy if there ever was. And, to end, anything by Terry Pratchett. Rarely, I think, has fantasy/ science fiction managed to be both so hugely entertaining and so mordantly, precisely satiric: about politics, about society, racism and sexism and corporate greed and so much more. Akram Khan is planning to adapt one of the poems of Until the Lions for stage as his 2015 company piece. That would be very exciting — especially as it would mean a reunion of practically the entire core creative team of DESH. It would also mean adapting the poem into a script for dance, always a challenge but a very stimulating one. Joëlle Jolivet and I are hoping to work together again, this time on a more tongue-in-cheek look at mythical monsters, dragons in particular. Dragons have been very big in my life, and they are great subjects for a visual artist/illustrator.